If a rational Creator started this whole thing, then there has to be a â€œDNA connection,â€� as it were, between the One who creates and what is created. One of the many wonderful things that scientists are discovering as they compare their observations through microscopes with those through telescopes is that the pattern of the neutrons, protons, and electrons in atoms is similar to the pattern of planets, stars, and galaxies: both are in orbit around one another, and all appears to be in relationship to everything else. We now know the same is true in biology, as Robert Lanzaâ€™s work on biocentrism so brilliantly demonstrates: â€œthe universe is created by life and not the other way around.â€�  Our word for that foundational life is Spirit, hovering like a brood hen over the formless void in the very first lines of the Bible (Genesis 1:1-2). In other words, it is an entirely relational universe. If, at any time, we try to stop this flow moving through us, with us, and in us, we fall into the true state of sinâ€”and it is truly a state more than a momentary behavior. It is telling that the first destabilization of the foundational structure of the atom (in New Mexico in July 1945) created the atomic bomb. With supreme irony, the test site is still called â€œTrinityâ€� as Robert Oppenheimer first named it. The divine flow either flows both in and out, or it is not flowing at all. The â€œtrap doorsâ€� at either end must be kept open in order to both receive and let go, which is the work of all true spirituality. The Law of Flow is simple, and Jesus states it in many formulations such as â€œHappy are the merciful; they shall have mercy shown to themâ€� (Matthew 5:7). Or as we cleverly put it â€œWhat goes around comes around.â€� We are conduits. Grace is always present. You imagine it is somewhere high in the sky, far away, and has to descend. It is really inside you, in your Heart. Grace is the Self. . . .You are never out of its operation. Whether life appears to bring tears or laughter, it is all grace. Grace fills the world, but only a heart awakened to Love will taste its depths. In awakening we understand that grace is always present. There is a basic trust in lifeâ€™s movement and its goodness. We realize that whatever is here in the moment is a gift, if we can receive it as such. Whatever is here expresses lifeâ€™s wholeness and can be an invitation back to its Source. Awakening allows us to freely appreciate the gifts of impermanence and continual flow, no longer bound by the suffering that comes from perpetually wanting â€œmore,â€� different, or unending experiences. 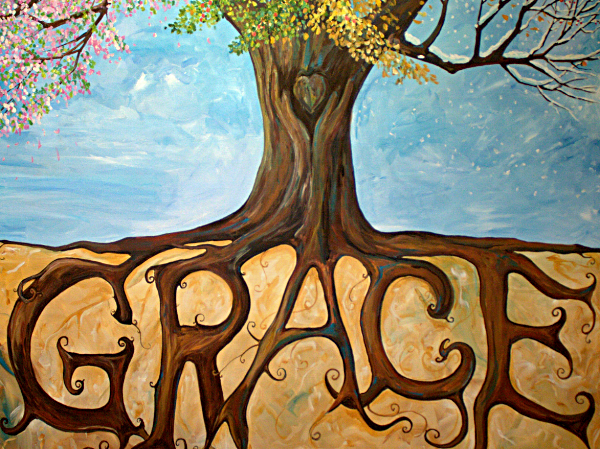 When we realize the movement of grace in our lives, the natural response of the heart is gratitude. Gratitude is not simply being thankful for things we deem beneficial or pleasurable. It is really a way of living and an expression of the peace we discover that is right here in all circumstances.